Happy Fall, Y’all! Last year, I rounded up 10 Fall Looks to Recreate and it became a very popular post. Those looks were my top 10 personal favorite looks. This year, I decided the first fashion post of the season should be my most pinned Fall outfits. Some of these looks are repeat from last year’s roundup, but most are new. 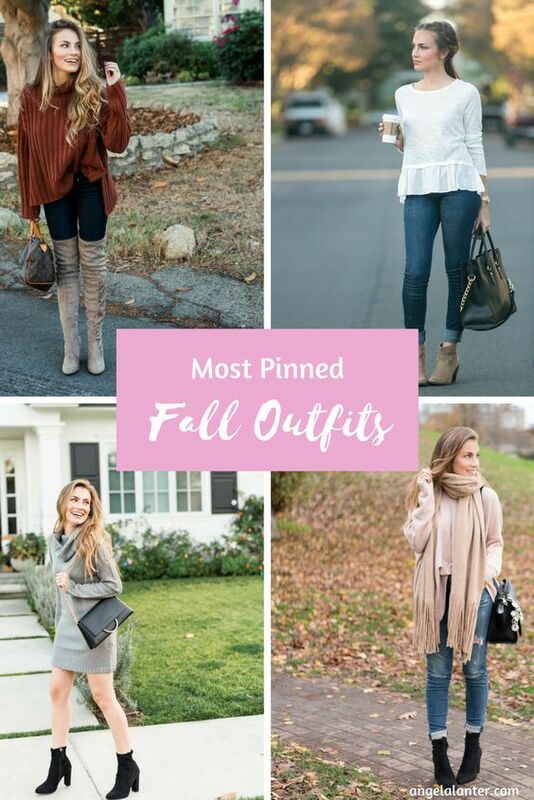 These looks are in no particular order, but here are the10 most pinned Fall looks I’ve created and shared on Pinterest. Because these outfits are older, I’m linking to mostly similar pieces so you can easily recreate these looks on your own. This look is a repeat post from last Fall outfit roundup, but it’s because it’s been pinned and re-pinned so. many. times. This look was from last November. I took these in California, but was actually living in Vancouver at the time. I love this look because it’s exactly the type of outfit I want to wear on an everyday basis in Autumn. Another look from last year’s roundup, but it’s definitely an oldie… I posted this look back in 2014. This one just has cozy written all over it. This look is from last Fall/Winter. This dress and scarf combo was under $50… What a steal! This look is also from last Fall. We took these photos in Vancouver but this post ended up being one of my popular blog posts because I shared my blogging story. One of my early Fall looks… This gem is also from 2014. I still love this outfit, but even more so, I really love my braids. Here’s a tutorial for a similar crown braided hairstyle. I really like ruffles and apparently so do my Pinterest followers. This look was actually from this past Spring in Atlanta, but it came up as one of my most pinned Fall outfits. I love a sweater dress because it’s feminine but practical. It keeps you warm on chilly days and pairs so well with tights and boots. Another look from this Spring in Atlanta… But this also comes up under my Fall looks on Pinterest. I love this coat I bought in Vancouver last Fall from Aritzia. 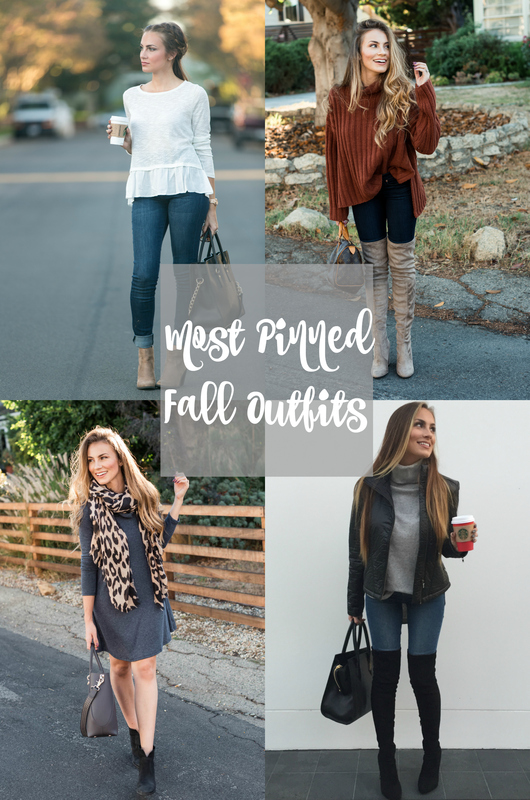 Leave a comment below and let me know which of these looks is your favorite for Fall! 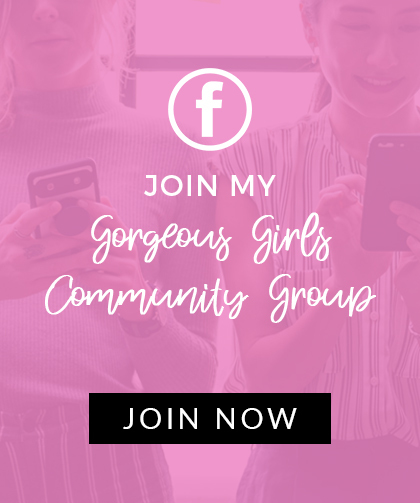 Next Post The Secret Sale You Don’t Want to Miss! I’m looking forward to shopping your fall looks! I’m on the hunt for new jeans this fall and you’ve solidified my choice of going for some Paige jeans! Thank you! I’ve been lazy with my hair lately, I need to start doing cute braids again! I remember seeing so many of these and they are all my faves! So many great looks that I can’t choose which one is my fave! I LOVE everything!! 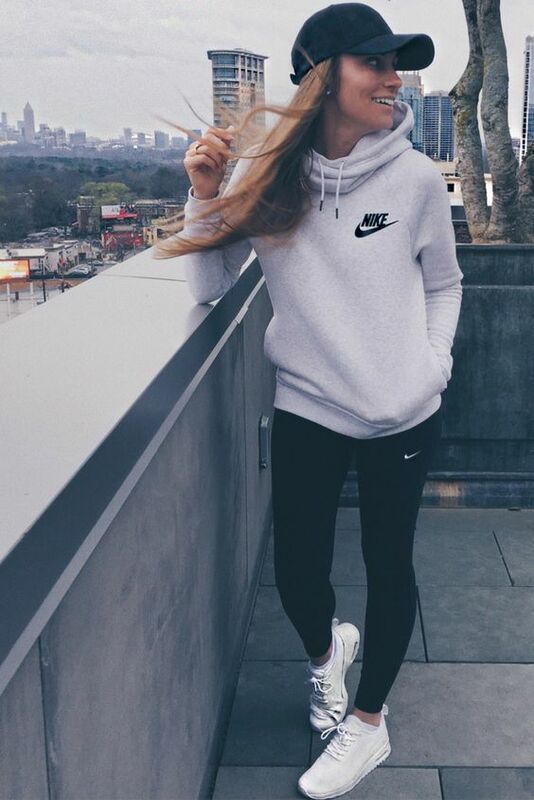 Seriously getting some major fall inspo right now!! Look #5 is my favorite! I love the big scarf! I love scarves, especially blanket scarves! Me too! I enjoyed your video tutorial on how to wear them!